Lopez Ag Service sits atop 152 acres in Sacramento, CA where we recycle, reuse, produce and process many types of agricultural products. Our wide variety of agricultural products include Landscape Compost, Rice Hulls, Recycled Gypsum, Rice Hull Ash, Ag Gypsum, Organic Compost, Chicken Manure, Forest Humus, and much more. The Lopez Ag Service Yard is operated daily with many different types of heavy equipment machines including wheel loaders, excavators, water trucks, agricultural equipment and much more. Each of our machines undergo monthly maintenance and quality assurance to keep our job site running smooth. 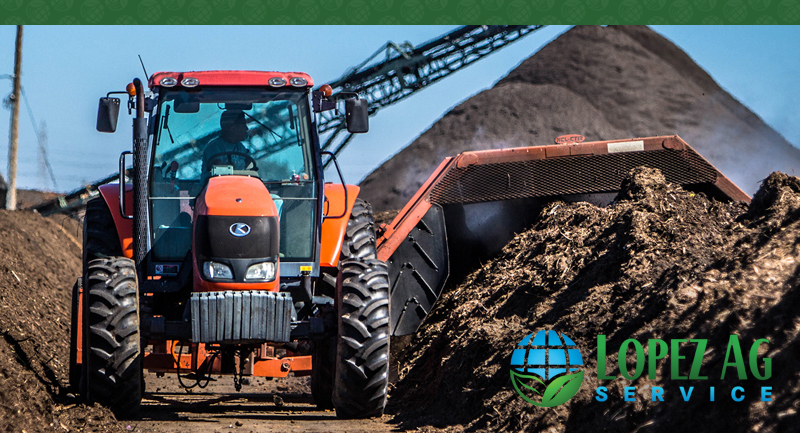 Our Organic Recycling and Composting Facility Services in Sacramento range from Organic Soil Recycling to Organic Recycled Gypsum and include other services that run daily from Top Soil Transport and Trucking to Agricultural Spreading Services. The Lopez Ag Service premium Mulch and Compost lines are top favorites among our large list of clientele in Northern California and the greater Sacramento area.